Vacations are pretty much synonymous with summer. So many people take off to their favorite fun, relaxing spot at some point during the summer months. Not this family. We don't take vacations. I don't think it was that big of a deal when the lovelies were growing up since the beach is a mere 3 miles from our front door. Closer if we draw a straight line from our backyard to the shore. So we pretty much spent every summer day at the beach, the lovelies and I. We spent every day of our week at the beach, at the beach. We awoke to a fully prepared breakfast- eggs, grits, bacon, homemade biscuits and sometimes pancakes and then headed off across the street to the ocean. After waiting the traditional hour following eating breakfast, of course. We would come back across the street, rise off in the outdoor showers and back up the stairs for lunch- usually sandwiches and chips- and then head back to the beach. Again, waiting that hour after eating to enter the water. We built massive sandcastles and had fun riding the waves on those canvas floats with the nylon ropes around the edges. Remember those? And wearing the t-shirts due to the sunburn from the day before? Until there wasn't because we all grew up and out grew family vacations. Or moved away and the miles led to distance separation. Luckily, we never let the distance in miles lead to distance in our hearts. We always visited and called and wrote letters---actual letters with actual pens and paper. 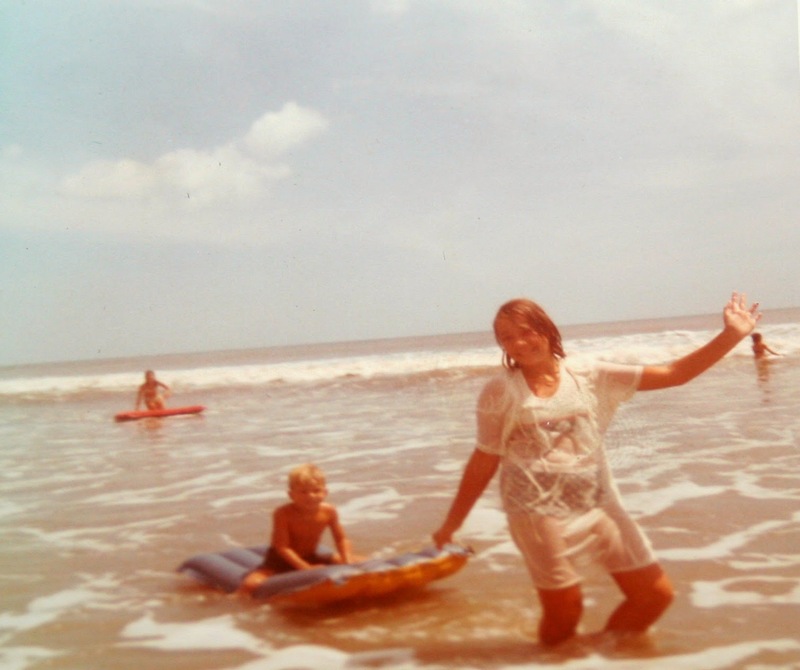 And now, we know that Grandmother and Granddaddy were the best ever at creating memories. Memories that are still cherished today. I'm having a nostalgic summer, obviously. Sometimes, you just can't help it. Share some of your nostalgic summer memories. Well, first of all let me say I loved hearing about your childhood vacations and all the memories you have. It is a blessing to grow up surrounded by a loving and fun family! Our summer vacations were spent in Ontario, Canada, at a fishing camp (Nina's Camp) of Rice Lake. It, too, was the whole family. Grandparents, parents, cousins, aunts & uncles, and even my BFF and her family, one year. Going always included a stop over at Niagara Falls. Great memories. Terri- Canada is so beautiful! I've only been once and that was in grad school when I went to Toronto for a conference. A college friend lived in Rochester, NY and met me up there and we had all sorts of fun. We went to a theater- really big screen-- and saw a film about western Canada. I've never seen such beauty before. Since then, I've read so many books set in Canada and have always wanted to return. I love your reflections as a child. 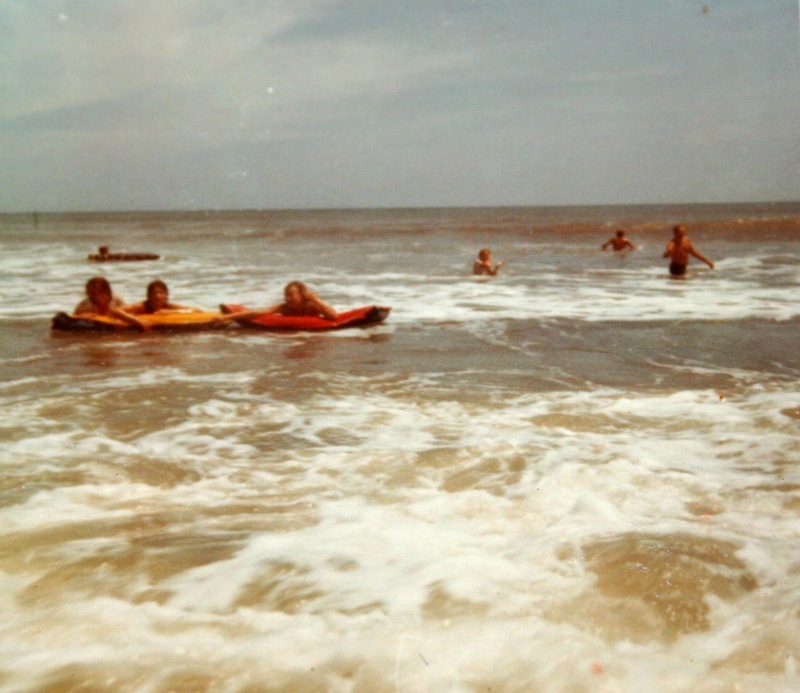 Yes, we used those same kind of rafts when we would go to the beach and I spent all day every day in the water. I love that your whole family went and you had such a wonderful time with extended family in the same house across from the beach. Such nice memories to share and to reflect back on. It is also very nice you live so close to the ocean now. That has to be heaven. Kim- It is, in most ways. The worse part is tourist season. Other than that, it's pretty dang awesome. :) Perhaps you should just hop on a plane, fly over here and find out for yourself! Noxzema definitely gives me flashbacks from my past. Your memories sound perfect....so glad you got to experience that! I love fried catfish & shrimp cocktail! My favorite memories are those of going to my Grandparents fish camp.